Friends of Troopers Hill, Friends of Canford Park, Friends of Old Sneed Park, and Friends of Horfield Common are interested in working with a small team of students to conduct surveys and monitoring of flora and fauna in their respective locations. Tasks may include: basic habitat quality surveying, presence/absence, abundance and distribution of different species, size and health of populations, and recording changes over time. Sneed Park Nature Reserve is especially interested in students to survey and monitor mammals, aquatic life, lichen and invertebrates. Canford Park is specifically interested in surveying the plant life in the park and monitoring the bat population. Horfield Common is specifically looking for students to lead four wildlife surveys throughout 2015/16 to build up a base dataset recording the wildlife on Horfield Common. These surveys would enable FOHC to track the improvements in numbers and variety of wildlife species following work being undertaken to improve these throughout 2015. To date, the group have been using ‘Project Noah’ - a free wildlife recording app & are keen to improve the visibility and recording of wildlife in the area so would very much appreciate your contribution and support for their work. You will work with, and be supported by members of the respective park Friends group who will meet with you to discuss the project & introduce you to the area/familiarise you with the site. This is a great project to support volunteers working to maintain and improve the unique assets & nature in Bristol. Suited for: These positions are suitable for Biology, Environmental Science, Geography, and Wildlife Management students, and provide excellent live project/work experience opportunities. 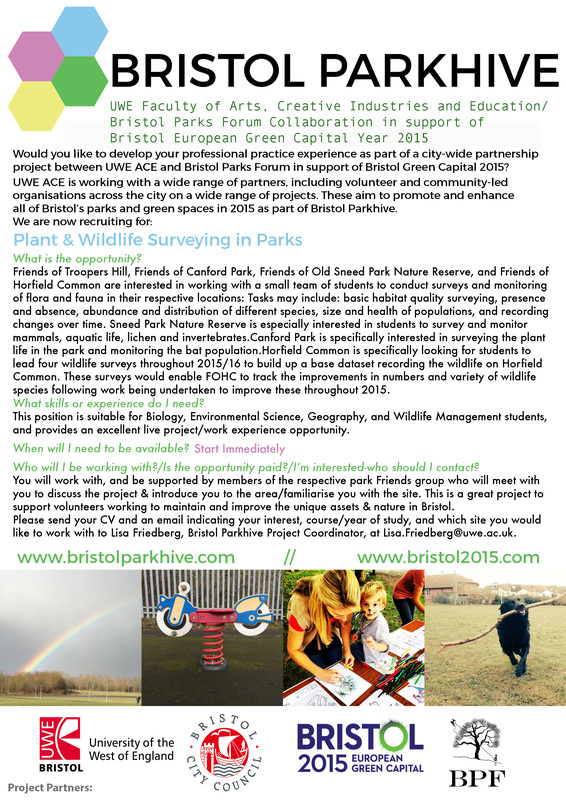 Please send an email indicating your interest, course, and year of study, and which location(s) you are interested in to Lisa Friedberg, Bristol Parkhive Project Coordinator, at Lisa.Friedberg@uwe.ac.uk.